Howdy! Our club is launching a new initiative that we hope will be both a great benefit to local Aggies and to our local Aggie businesses. We will be creating a directory of local Aggie Owned and Run Businesses that we will distribute electronically to our club members and new Aggies in town. If you’re a business owner or run a local business, please fill out our form below! We want a tangible way to support our Aggie O&R Businesses after years of them being such a support to us; we hope this will become a way to do that. 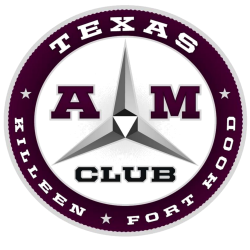 Copyright © 2019 Killeen/Fort Hood Area A&M Club.